In the United States alone, there are over 1,300 endangered or threatened species. Around the world, there are thousands more, with new species becoming endangered every day. The best way to protect these species is education. Knowing which species face extinction help us develop conservation plans that can bring them back from the brink of disaster. Read on to find out more about conservation issues and ten endangered species to watch out for. The beautiful Asian Elephant once numbered in the hundreds of thousands in Asia. There are now fewer than 50,000. There are two major threats to these creatures. One is deforestation and the increasing human population that is encroaching on their land. With this happening, elephants end up inbreeding as they don’t have other herds to mix with. The second is the ivory trade. The ivory trade was banned in 1989, but there is still a thriving illegal ivory industry. Another magnificent creature, the Bengal tiger, is on the endangered species list. There are around 2,500 left in the world at the moment. There have been efforts to save the tiger, including numerous tiger reserves in India. Unfortunately, illegal poaching is back on the rise which further threatens these beautiful creatures. China has just lifted its ban on using tiger and rhino parts, which will further impact these creatures. The blue whale is the largest mammal on earth and is even louder than a jet engine. Even with their big presence on this globe, the blue whale is an endangered species, with numbers of 10,000-25,000 living in the ocean. Back in the early 20th century, the whaling trade, now banned, killed thousands of these whales. Even after the ban, threats like environmental change and getting tangled in fishing gear still exist. Climate change has had a huge impact on krill, which is their only food source. Without their food source, blue whales cannot survive. The gray wolf is no longer on the endangered species act, still faces an immense threat to their existence. While wolf numbers are on the rise, they are only in fragmented places across the United States. With divided opinions on how to treat wolves, it is becoming increasingly difficult to reintroduce them to their former habitats. There have been efforts in Colorado to reintroduce wolves back into the Rocky Mountains. Learn why there is such a growing movement in Colorado. The chimp, our closest relative, is also classified as endangered. They have disappeared completely from four different countries and are continuing to disappear. Threats like illegal poaching are the biggest problem for these creatures. People use chimpanzees as bushmeat and baby chimps get taken and sold as pets. Other threats like deforestation also threaten these creatures as well. The Grizzly bear, once roaming the whole of the United States, is now listed as a threatened species. At the moment, the U.S. Fish and Wildlife Service is reviewing the status of the Grizzly bear population. There are efforts underway to assist in the recovery of these creatures in places like Yellowstone National Park. Threats like loss of habitat are what continue to drive these creatures to endangered. They were once poached in the early days of the American West until the government banned poaching. These sweet and beautiful creatures with their striking red hair are classified as critically endangered. The Sumatran orangutan number only around 7,500. 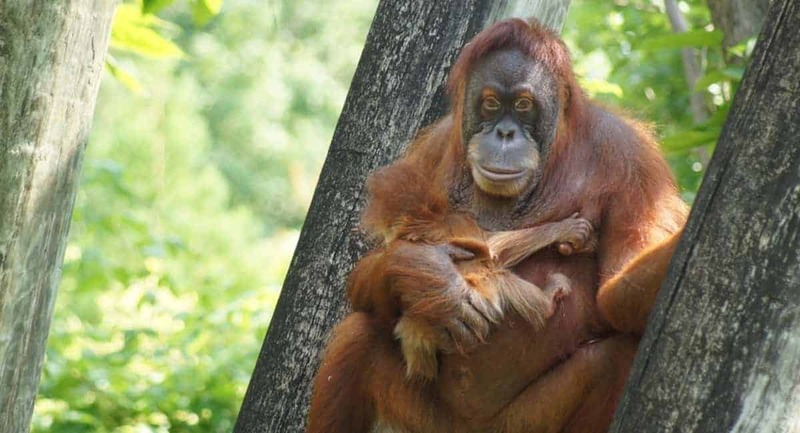 Orangutans are usually killed because they have destroyed crops. This only happens when they can’t find their own food source and have to go to farms to find it. The pet trade also threatens these species, with young babies taken from their mothers and sold as pets. For every orangutan sold as a pet, as many as 3-5 animals die in the process. Deforestation is also a big threat to this species. Palm oil plantations are taking the place of their forests, destroying their homes and food sources. The black rhino is another animal classified as critically endangered. Only 5,000 to 5,400 exist in the wild. There have been continual efforts to keep the black rhino away from extinction and numbers are on the rise. Even so, a lot of hard work needs to continue if we want to keep the black rhino from disappearing completely. The biggest threat to the black rhino is poaching. Rhinos have two large horns which make it valuable for poaching. Loss of habitat is another threat to these creatures. When they don’t have anywhere to go, there is a higher risk of poaching and even inbreeding. While the manatee is off of the endangered species list, they are still classified as a threatened species. The positive is that the manatee was on the brink of extinction in the 1970s. There are an estimated 6,620 Florida manatees living today. There has been a lot of backlash over the decision to move them to the threatened classification. While the manatee population is increasing, putting it as a threatened species will make it more susceptible yet again. With Florida being a tourist destination, boats are the biggest threat to manatees. oat propellers and collisions kill many of these animals. Pollution is also a big threat to manatees, as they accidentally eat trash and plastic, thinking it is food. Talking about conservation issues is not only reserved for scientists and outdoor enthusiasts. It’s a conversation everyone needs to have. The way our planet is being affected by different problems should alarm all of us. We all need to do our part in making sure our planet is sustainable and lasts for generations to come. Learning about endangered species and how to help them is one way to start. Another way people are helping the planet is changing the way power industries are being operated. If you want to learn more, check out our article on solar farming and other ways power companies are becoming more sustainable.